A selection of Vegetarian and Vegan tips and Recipe ideas.. Learn about Foods to eat in abundance. especially for cancer and other chronic illnesses. (a deliciously rich smoothie which is also an excellent Thread Tape & Round Worm Repellant. from the book 'A Mission of Love'. Foods to eat in abundance. Eat plenty of raw or lightly steamed vegetables (especially broccoli, cauliflower, cabbage, celery, pumpkin, aubergine, etc). Tomatoes (raw, cooked or tinned). Lentils & pulses (including pearl barley), tofu, soya sprouted seeds and beans. Cooked root vegetables (especially yams, carrots, sweet potato). especially for cancer or if chronically ill.
(substitute milk -for soy, oat, almond, coconut or rice milk). boiling water in a sauce-pan. 1 level dessertspoon of any Gramma's Herbal Seasoning. De-seed and dice ½ red and ½ green sweet pepper. Grate 2 garlic cloves- (optional). 1-2 tablespoons of Olive Oil - (optional). 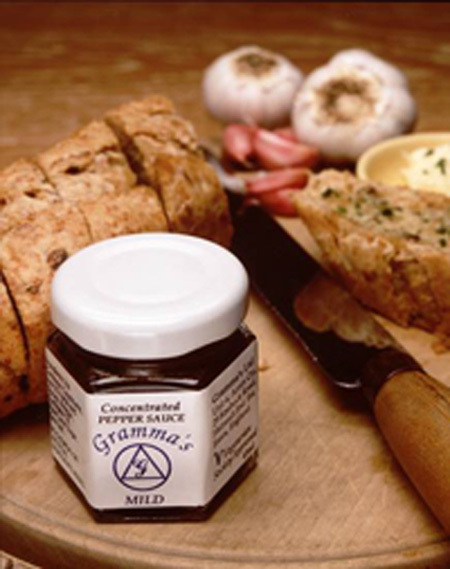 ¼ teaspoon of Gramma's Pepper Sauce. 8oz (250g) rice and mix well. Bring to the boil, reduce heat, cover and steam cook for 25 minutes. Add 1 celery stalk (dice small). Add 8oz (250g) green peas. Add 1 can (400g) sweet corn (drain). Add 102oz of Coconut Cream (dissolve in the stock). black eye peas or congo peas) - drain. 350 mls (12floz) boiling water. Add the oil into a pot. Add the garlic and ginger and gently heat for 2 minutes. Add the stock cubes and crush. Add the thyme, carrots, celery, green beans - stir well, cover with lid and gently simmer for 10 minutes. Add the onions, sweet peppers, mushrooms, sweet corn - stir well and gently simmer for 2 minutes. Add the soy (or tamari) sauce, tomatoes, lemon juice, herbal seasoning, pepper sauce, coriander leaves - mix well, cover and gently simmer for 15 minutes. turn off the heat and leave for 20 minutes. Use a fork to stir and fluff-up the cooked couscous. Serve : as part of a main course or on its own with fresh salad. Add 250g ( ½ lb) fried tofu (cut into small cubes) at the soy sauce stage and continue as above. PAPAYA and pineapples are rich in enzymes which aids the digestion of proteins, carbohydrates and fats. Pomegranate seeds contains Alkaloids, which paralises tape worms and PAPAYA seeds does the same to thread and round worms. 2 tablespoons of Omega Oils. First liquidise the pomegranate and papaya (fruit, juice and seeds) for a few minutes, until seeds are finely crushed - then add remaining fruits and omega oil. Liquidise until very smooth and thick. Serve : Serve into desert bowls or tall glasses. If desired - chill in the fridge for a few hours. Makes 2 litres (3 pints) - serves 4 to 8. Drink this for 3 to 7 days consecutively, then take a laxative (last thing at night) to get rid of all intestinal worms. It is said that 80% of westerners are infested with these internal parasites which are harmful and causes serious illness. Therefore, it is advisable to de-worm every six months (or at least once a year). * This delicious desert can eaten throughout the year without laxatives. This recipe is great for all the family, including weaning babies. 1-2 tablespoons of Lemon Juice. Peel all the vegetables and cut into thin slices. Add water, lemon juice and salt to the pot and mix in well.. Drain off remaining water into a bowl, allow to cool and refrigerate or freeze - to use as stock - in soups, stews or gravy. Either add the Olive Oil or Spicy Garlic Butter, or a little of the 'stock water', then mash until smooth. To finish, mix in a hand full of fresh finely chopped parsley, coriander and chives. Serve : with a main course meal. or, top individual portions with grated cheese and serve with fresh salad. of natural foods in 'A Mission of Love'.